How much do you love fantasy shows like American Gods? Well, you’re in luck because we’ve rounded up 10 more fantastic (and fantastical) shows that we think you’ll love, just in time for binge watching season! Let’s check them out! American Gods is a drama, fantasy television series that is based on the 2001 book, of the same name, by Neil Gaiman, who happens to be one of my all-time favorite writers. The series airs on Starz and made its premiere on April 30, 2017. 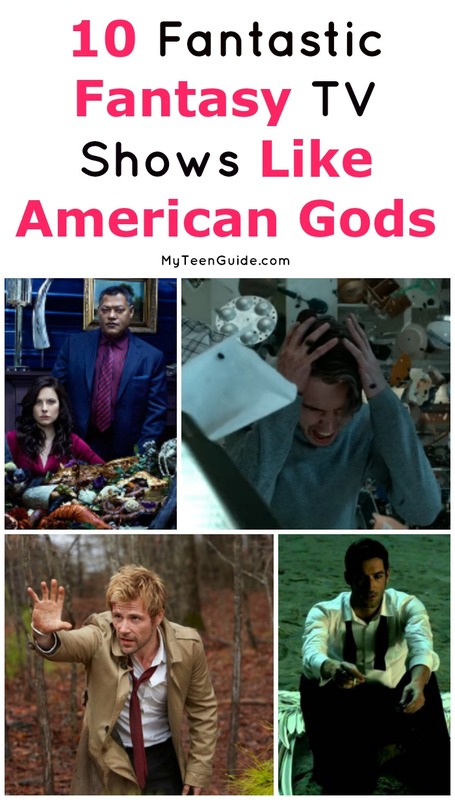 Here are some awesome TV shows like American Gods. Constantine is a drama, horror television series that features the character, Constantine, from DC Comics. It aired on NBC for 1 season, from 2014 to 2015. John Constantine (Matt Ryan), a demon hunter, deals with the sins of his past while protecting humanity from supernatural threats. Hannibal is a crime, drama, horror television series that is based on the 1981 book, Red Dragon and the 1999 book, Hannibal by Thomas Harris. It aired on NBC for 3 seasons, from 2013 to 2015. The series showcases the early relationship between Dr. Hannibal Lecter (Mads Mikkelsen), a famous psychiatrist and Will Graham (Hugh Dancy), a young criminal profiler with the FBI. Jonathan Strange & Mr. Norrell is a British drama, fantasy, history, sci-fi television miniseries that is based on the 2004 book, of the same name, by Susanna Clarke. It aired on BBC One for 7 episodes in 2015. Jonathan Strange (Bertie Carvel), a daring, novice spell caster and Mr. Gilbert Norrell (Eddie Marsan), a gifted recluse, use magic to help with England’s war against France. Legion is an action, drama, sci-fi television series that is based on the character, David Halley/Legion, from Marvel Comics. It has aired on FX for 1 season so far, premiering on February 8, 2017. David Haller (Dan Stevens), diagnosed with schizophrenia as a young boy, has a weird encounter, giving him strange powers. Lucifer is a crime, drama, fantasy television series that has aired on Fox for 3 seasons so far, premiering on January 25, 2016. Lucifer Morningstar (Tom Ellis), bored with his life as the ruler of Hell, decides to head to Los Angeles to start a new life. Olympus is a fantasy, mythological television series that aired on SYFY for 1 season in 2015. Hero (Tom York), who is on a quest to discover his true identity, may hold the key to opening the doors of Olympus. Outcast is a drama, horror television series that is based on the comic book series, of the same name, by Robert Kirkman. It has aired on Cinemax for 2 seasons so far, premiering on June 3, 2016. Kyle Barnes (Patrick Fugit) is a young man who is searching for clues about why he’s been suffering with demonic possessions. Preacher is an adventure, drama, fantasy television series that has aired on AMC for 2 seasons so far, premiering on May 22, 2016. Jesse Custer (Dominic Cooper), a preacher in a small town, asks Cassidy (Joseph Gilgun), a vampire, to help him find God. Supernatural is a drama, fantasy, horror television series that has aired on The CW for 13 seasons so far, premiering on September 13, 2005. Brothers Dean (Jensen Ackles) and Sam (Jared Padalecki) Winchester, hunt demons, gods, ghosts and monsters. The Magicians is a drama, fantasy television series that is based on the 2009 book, of the same name, by Lev Grossman. It has aired on SYFY for 2 seasons so far, premiering on December 16, 2015. Students at Brakebills University for Magical Pedagogy, discover that a children’s book magical world is not only real, but dangerous as well. Supernatural is my favorite! I can’t believe that show has been on for so long! Then again, it’s so good, maybe I can! Which of these shows like American Gods is your favorite? Share below!